This cutting edge technology has been honoured at UK Dairy Day in Telford, Shropshire as the Best New Product Innovation Award. 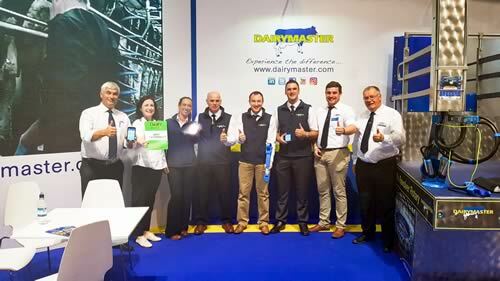 The judges were so impressed with Dairymaster that they also awarded them best stand. This App works in tandem with the MooMonitor+ collar, and no matter how big the herd is this App has the power to ID animals that need their attention, anytime, anywhere. The visual picture of their herd allows them to easily identify cows when they are in heat, ill or simply not thriving. “We are delighted to have won such a prestigious award today for the MooMonitor+ App. It is a powerful tool to help farmers make the right decision at the right time, which is getting more and more important as herd sizes increase”. The dashboard of the two-way App gives a very visual, easy to read update of what is currently going on with the herd and what needs to be done. It classifies the animals and allows farmers to manage each individual cow’s health and fertility easily. One of the advanced unique features of the App is that it provides farmers with Live Behaviour Graphs mapping multiple kinds of behaviour relative to other cows within the group. The MooMonitor+ App can be used to assess each cow or the number of animals affected together and for how long. When the system detects sick cows it will send an immediate notification direct to the farmer’s mobile allowing them to intervene sooner. Veterinarians or AI technicians can have access to farms and can even monitor several farms on their mobile. Even assigning a collar to the cow is an easy task with the App. By simply swiping the tag with a compatible phone, the smart technology allows for the cow’s ear tag number to be entered immediately onto the system removing the need to go back to the PC. The innovative technology also allows for information about tasks/events carried out on farm, such as insemination, pregnancy check, Body Condition Score, health event, dry off and more to be directly uploaded via the App. It is even possible to do real time drafting with the App. One of the other unique things about this App, is information is re-computing every 15 minutes, therefore the farmer has up the minute information about the herd. The data is eight times more granular than most systems on the market and contains more measurements of animal behaviour than other systems. The MooMonitor+ measures the intensity of activity and classifies it into three different intensities (other systems only have one intensity) and it also knows the number of seconds of resting, feeding and rumination for each 15 minutes of the day. Again most comparable systems have these in two hour intervals. This advanced App is designed for both Apple and Android phones. Much like Facebook, the easy-to-use MooMonitor+ App software is cloud based and is accessible from anywhere in the world on an unlimited number of devices and platforms across multiple languages which is connected to the internet via a secure login.